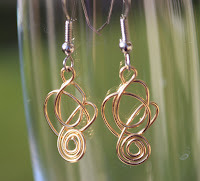 Mini Brass Jumble Earrings: don't they look pretty in the sun! I always enjoy making the jumble earrings - no matter how many times I make them, every pair is always different, though they have a similar style. I always have fun making the first earring - and then struggle to match it for the second! I've started making the pair in stages though (one loop on one, then one loop on the other, etc) so it's become much easier to match the two. Also, a shout out to SewMoe, who made me this beautiful dress! Not only is it gorgeous, but I gave her my measurements Sunday, and she had it done yesterday! I am amazed. Thanks Moe!